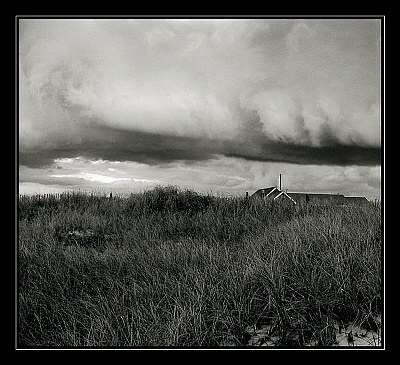 About This image was taken at Sandy Neck Beach, Cape Cod Ma, on Sept. 25/06. This is the exact same image as my previous post "Red Sky"
Different crop, converted to B&W, levelled and toned. The exposure was taken from the sky. Hand held, with a fairly low shutter speed. Thanks Andre :) your comments are always honest and this is something I really appreciate. You will get comments from me anyway at either account. I thought about the position of the building, and decided that this more hidden view would in the long run be more effective. A little more mysterious maybe? I'm glad you like my work! It's very nice of you to say that. Thank you. I thought that you might like this one. I was very happy with the effect in B&W. The feeling that I get from the grass and clouds reminds me of some of your images, so I am especially pleased that you like it. The clouds were great that day! I just have to ask... There is a new Usefilm member with the initials FJ, from Canada, using a Cannon 300D, with only a few images up. I just had a look at them and the style seems very familiar to me :) I'm just wondering if this is someone with a similar style to you or have you started a new portfolio? Yes! a powerful BW image Andre! I do agree with you that the mood is very different from the color one, the color one is beautiful but I like this one more, the clouds are just magnificent! Lovely vision, great sharpness and framing. I personally would have liked it even more if the house was a bit more visible. :) Always love your work. Thanks for the comment on this one. I think that dune grasses in general have so much potential in B&W. Especially when flowing in all different directions. There is only a hint of what I'm talking about in this one. But the more I see this one, the more I like it. I think the shores of New England are almost identical to the shores of Old England. So many similarities. This is one of those images that doesn't appear too overwhelming at first, but I find myself liking this version more and more all the time. I even put it on my desktop and I'm still not tired of it. Sometimes that happens to me with an image. Yes, there is quite a difference in their mood. Here, the structure doesn't look so inviting...and the foreground grasses seem to be the main subject. Thanks Galal, for visiting and commenting! Nice composition & tones , well taken . Quite a difference in this image, that's for sure. Thanks for visiting and for commenting Don! The image just before this one in my portfolio is exactly the same shot with a different crop and colour. You might be surprised at the difference the colour makes in altering the perception of the image. I'm glad you see this version the way you stated. The sky looks more dramatic in this shot, Andre, whereas the colour was more spectacular from a visual standpoint. You're right the change in mood is substantial and can be completely different between the colour and b/w.